You hear it all the time, people who identify as a Democrat then specify that they are a Liberal or a Progressive as if it was a sub-section of the Democrat Party which it is not. In reality it’s a cagy way of saying they are a Democratic Socialist and there is nothing Democratic about it, just socialism. Socialism is a watered down application of Communism in the varying forms of International Socialism as practiced by Russia’s communist state of the Union of Soviet Socialist Republics (U.S.S.R. 1917-1991) which would have had a One World Government with Russia as its head. And National Socialism as was used by the National Socialist German Workers Party which is the full and correct name of the German NAZI Party of World War 2, National Socialism seeks a single party control of a country. In an effort to legitimize themselves, and as a sick joke, Socialist and Communist Countries put the word Democratic in their country’s name. Two shining examples are the old Soviet Russian controlled East-Germany that was titled as the Deutsche Demokratisch Republik (German Democratic Republic) and Democratic People’s Republic of Korea (DPRK). In each case there is nothing Democratic or a Republic about them, they were and are dictatorships, socialism is nothing more than a tool used by the powerful to control the believing masses. 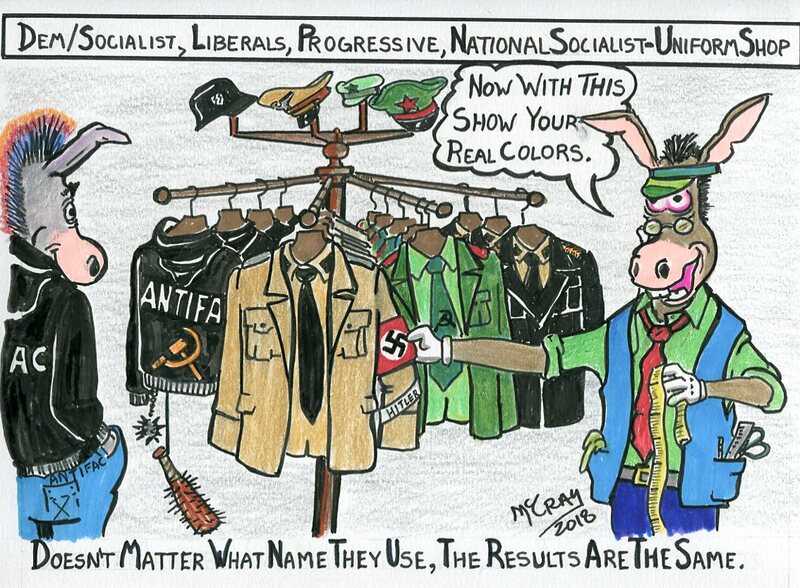 There is little difference between the types of Socialism, the socialist left of the so-called Democrat Party is following the NAZI’s fascist rule book. Using the ANTIFAC street thugs in the same manner of the NAZI Brown Shirt Storm Troopers to silence the opposition with force and terror. Under their iron rule there is no free speech, no private ownership of firearms, the total control of the press which is used for a propaganda source; they bar those who disagree from jobs such as teachers especially conservatives and the religious, control the schools, control the students by indoctrination, and only one political party is allowed. Another hallmark of the NAZIs was to dehumanize groups and religion, the NAZIs targeted the Jews of Europe blaming them for all of the problems that affected Germany, and that led to the death of 10 million people in the concentration camps; of those 6 million were Jews. In total, the hell that was unleashed by the NAZIs and their allies caused the deaths of over 60 million people (20 million soldiers and 40 million civilians), that is 3% of the earth’s population at that time. Now the Socialist left has been targeting conservatives and Christians - are we watching history repeating itself? For the Socialist, the final step to be successful is the elimination of all rights and establishment of the Fascist Jack Boot Police State that threatens all.